While a dominant male fish from northern Mexico mates with a female, a small fella bides his time in the offing. Suddenly, the little guy darts in ahead of Mr. Big and plants his seeds on freshly laid eggs. The behavior, which biologists aptly call sneaking, is rare—known to occur among only a few dozen of about 34,000 fish species worldwide. 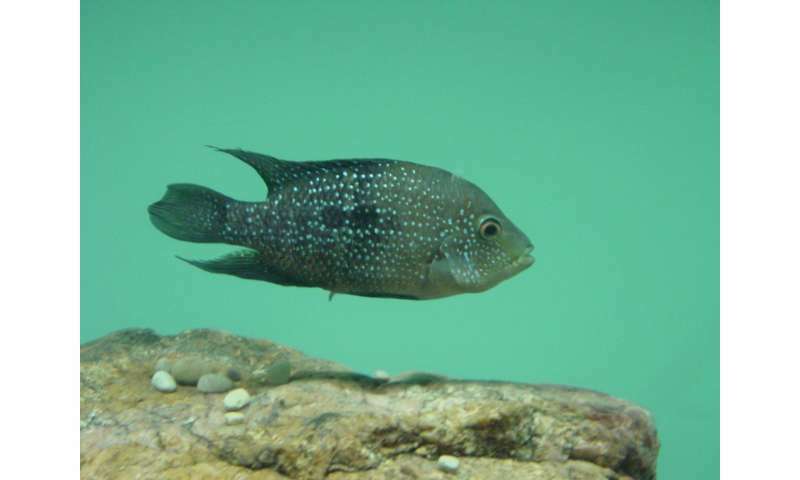 A Case Western Reserve University researcher reports that the Cuatro Ciénegas cichlid, a rare fish by the scientific name of Herichthys minckleyi, uses this alternative stealth mating strategy. Ron Oldfield, a senior biology instructor at Case Western Reserve, videoed the underdog's effort to pass on his DNA in a 300-gallon aquarium. The video recordings are among the first of sneaking behavior published for any species of animal. Oldfield and collaborators published a description of the behavior in the journal Hydrobiologia and then last month the three videos in this release, along with further recordings, images and a research paper describing mating and parental care by the species, were published on Case Western Reserve's permanent electronic archive, DigitalCase, at http://hdl.handle.net/2186/ksl:HminckBehavior. DigitalCase is an initiative by the university to make information available to the public for free in an electronic format. "Sneaking has been recorded in diverse species, but overall it's uncommon throughout the animal kingdom, including fishes," Oldfield said. "Sneaking is especially rare in species that have monogamous mating systems. Among those species, there is no shortage of females, so no reason to sneak." But when "large dominant males monopolize multiple females, there are a lot of males that aren't competitive enough to get their own females, and sneaking is their only option to get their DNA into the next generation," Oldfield said. Cichlids are small perch-like tropical fish found in Africa, Asia and Central and South America, and include tilapia and aquarium angelfish. As a group, Central American cichlids are known for being monogamous. Oldfield, however, recently discovered in the wild that the Cuatro Ciénegas cichlids are polygamous, with a few very large males owning large territories that each contain multiple females. That leaves a lot of lonely males. Oldfield observed the sneaking behavior while sitting in his home office—a desk surrounded by large aquariums. 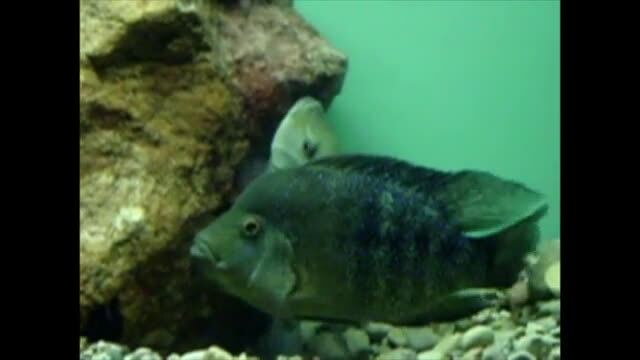 In one tank, "a large, macho male—the largest fish in the tank—was mating with the largest female in the tank," he said. "Another, smaller male was hovering obliquely in the water, hiding next a large piece of wood near the water surface, and was pointed straight at the mating pair." This species lays adhesive eggs on the surface of a rock. The female makes a pass across the rock and lays a row of eggs. Her male mate typically follows immediately after, releasing an invisible cloud of sperm over the eggs. In doing so, he adds his DNA to hers as the sperm cells bind with the eggs. "As the female finished a pass, in a sudden burst, the small male dove to the rock, tilted his underside toward the eggs, and then leisurely swam away and went back to his hiding place," Oldfield said. He could see the sneaker's genital papilla, which carries sperm outside the body, was enlarged, a sign the fish was very likely contributing to the gene pool. Both the large female and the large male attacked the sneaking male in an attempt to drive it away, but the sneaker still managed to insert himself several times before the pair finished spawning several hours later. During that time, "the sneaking male attacked other males and drove them away from the periphery of the spawning site," Oldfield said. Oldfield believes his use of large fish tanks, which allow the fish to act naturally, led to the discovery. Small tanks, he's found, can make fish behave differently from the wild. With the studies complete, the rare fish are expected to head back toward home. Oldfield plans to donate the fish to Odysea, a new public aquarium in Scottsdale, Ariz., where they will enter a captive breeding program administered by the Association of Zoos and Aquariums to preserve the species. Oldfield hopes the discovery will encourage people to conserve the environment of Cuatro Ciénegas. The basin holds hundreds of brightly colored spring-fed pools in the Chihuahua Desert and is home to the cichlid, which is listed as a threatened species, and dozens more unique fish, reptile, snail and plant species.